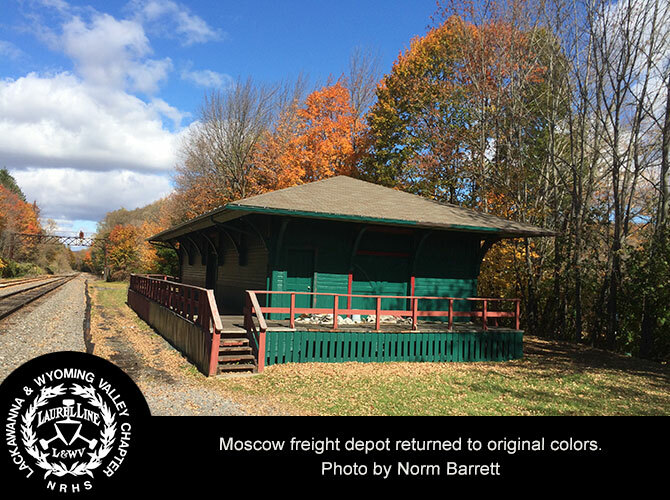 The passenger and freight stations in Moscow, Pennsylvania have been a fixture of the community since the Delaware Lackawanna & Western RR completed them in 1904. The brick depot served passenger needs, and the freight requirements where handled by the wooden depot a bit to the west. The separation of these duties into two structures is evidence of the DL&Wâ€™s faith that the farming village to continue growing. By the end of DL&W passenger service in the 1960s, both stations were showing their years and were shut down. Riders of the early Steamtown USA trains that began running from Scranton to Moscow in 1985 were not even allowed off the trains. The deteriorated structures were not suited for visitors. After Steamtown USA was reborn as the Steamtown National Historic Site, the National Park Service leased the stations from the town to provide a destination for the trains that would be running over the refurbished track. The stations themselves needed refurbishing. The freight depot was a shell with failing doors. Replacements were crafted in the Steamtown restoration shop in 1992, and completed in time to be installed at the depot for the first excursions of the 1993 season. The roof was also repaired, along the with stairs. A safety railing was installed on the loading dock so that people could safely watch the train operations. The freight station was used to hide a few port-o-lavs. The passenger depot was not as derelict, but needed new paint, floor repairs and a few other touch-ups to be amenable to travelers. An agreement was struck with the Lackawanna & Wyoming Valley Railway Historical Society to provide light refreshments at the station for the 1993 season; a relationship that lasted until the conclusion of the 2003 schedule. The National Park Service decided against renewing the lease of the station property, and the 2004 season featured many trains running to Tobyhanna’s recently restored station a few miles to the east. The Lackawanna & Wyoming Valley Railway Historical Society took over the lease and has renewed it every year since. With the return of Steamtown trains to Moscow, the activity has picked up, but there is always more work to be done. The L&WVRHS has pursued grants to make improvements to the freight station in recent years. 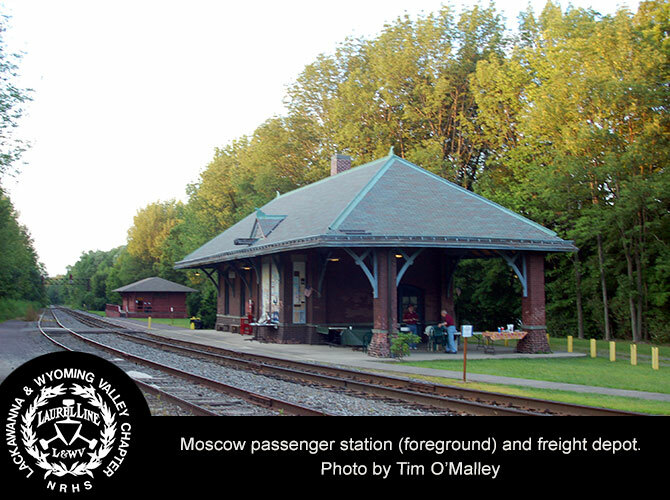 In addition, the group maintains the grounds and operates a gift shop and food service in the passenger station on days that Steamtown runs to Moscow. Freight House:	Painting the building, rain gutters installed, new decking, new lighting and a new handicap ramp installed. The Station:	New heat, insulation, powder coating grill to the baggage doors, windows and doors painted, lentil repair, new ceiling fans, additional lighting in kitchen, kitchen cabinets added, murals painted on 4 new window boards and pending for summer/fall 2018 a new roof. Grounds:	Multiple brush cutting projects as well as grass cutting. Activities over the years:	Station and Freight House open for Moscow Borough Annual National Night Out event, Little Pumpkin Express trains, Holiday Trains to Moscow Station, Annual Picnic & Program and Speeders annual arrival. 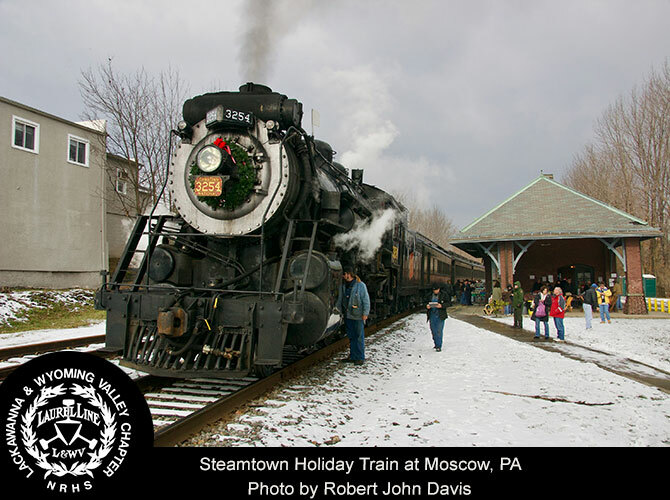 If you want to ride a train to Moscow and see the depots in person, Steamtown schedule features numerous trips throughout the year. For a deeper dive into the railroad history of the Moscow area, be sure to order a copy of Frank P. Adams/ hardcover book The History and Railroads of North Pocono, book published by the L&WVRHS.